This is our absolute favorite meal, my husband loves the taste and the way the house smells when I cook it… well, it’s mouthwatering. I love all the extra easy meals I can make out of it. I can usually get 2-3 more meals out of it for our family of four. My family likes the classic sides like wheat rolls, mashed potatoes, and green peas. When I find bags of potatoes on sale, I will have a Kitchen Prep Day and pull together some freezer mashed potatoes. I frequently find frozen veggies on sale, so this cuts way down on our overall meal costs. 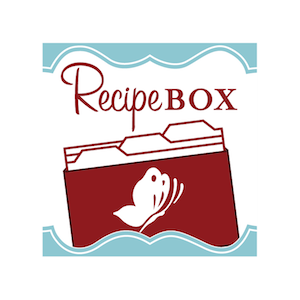 ** You can use any root vegetables you have like; turnip, parsnip, butternut squash, sweet potatoes, mushrooms or celery root. I just throw in what I have on hand. Also, in the picture, I ran out of onions, so I had to put them in after my grocery run, which was only 2 hours before we ate. It still turned out great! 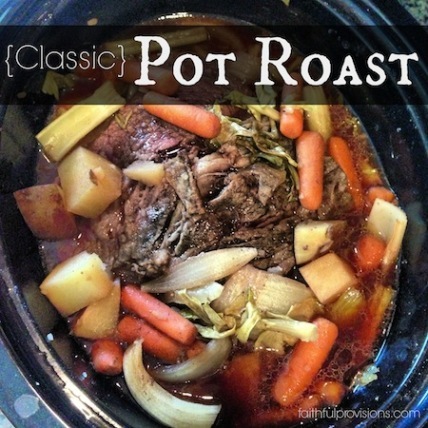 Dump beef and veggies into pot. Out of the tap, get the water warm and mix w/ soup mix. 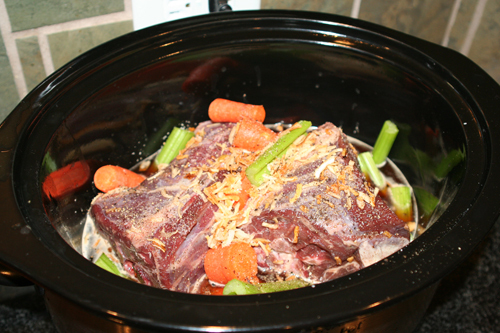 Pour over beef and all in crockpot. Sprinkle w/ salt and pepper. i also add cream of chicken soup, some allegro, potatoes yum! 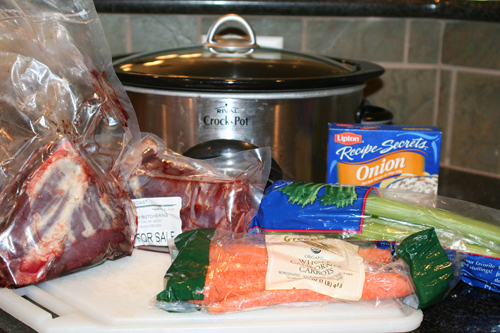 I have a great vegetable soup recipe if you need one.Thats what I always do with my pot roast leftovers. THis is my one of my husband’s favorite too! THe Lipton onion soup mix does have MSG in it . I have found that the target brand (Market Pantry) doesn’t have MSG so I try to buy that one if I can.